We love creating custom products for you! To make sure we can do so in a speedy and efficient manner, here are a few of our custom rubber stamp art requirements. These requirements are in place to ensure we always create a high-quality product that lives up to your expectations. All artwork must be black and white with no color or grayscale. * Black and white only is one of our custom rubber requirements because it allows us to create a uniform image or text of high standards. * We do not recommend reversed artwork of white text on black unless the white part is bold. Small thin lines will not hold up in reverse and tend to bleed together. * We suggest fonts be at least 8-point to provide readability. * We recommend no bold on fonts under 10-point font. Note: If you are having problems uploading your file, you can order your stamp blank and then send your artwork to sales@rubberstampchamp.com with your order # in the subject. * Make sure to sign your name in black ink with a solid pen. * Please do not sign with a felt tip marker. 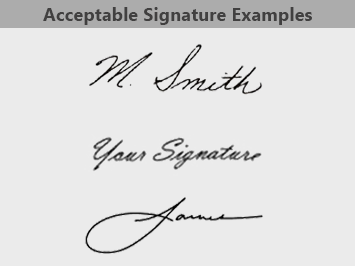 * Any breaks in the signature will show as breaks in your signature stamp. 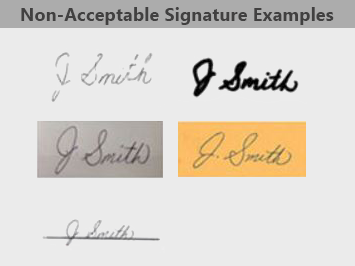 * Do not make any stray marks as they will all be included as part of the signature stamp. * Sign on plain, unlined paper. * If there is any type of line under the signature we will have to contact you and it may delay your order. While we offer our state of the art customization at no additional charge and we guarantee a crisp image, we suggest you follow a few basic steps to ensure you get the best results. If you are ordering a stamp with custom text or artwork, you will need to determine the type of stamp you need first of all. Once you have decided on the stamp type you need, click the red Customize button when you find the size you need. After that, simply upload a black and white jpg and we will get to work on your creation! If you have an intricate design or question about what is possible for us to create, please contact us for further assistance. Not sure which stamp is best suited to your intended design and application needs? We are happy to help in any way! At Rubber Stamp Champ, we are pleased to serve all your stamp related needs with our high-quality custom engraving. Find everything you need with our large selection of great brands and outstanding customer service!